Widely regarded as a creative genius and one of the best attacking players of all time, Tal played in a daring, combinatorial style. His play was known above all for improvisation and unpredictability. Every game, he once said, was as inimitable and invaluable as a poem. He was often called "Misha", a diminutive for Mikhail, and "The magician from Riga". Feel free to message only_tactics to setup a game against OpenTal. It's not as strong as the regular Mikhail Tal, but it does have the sacrificial tendencies as him! http://www.chessgames.com/perl/chessgame?gid=1139729 and this game is awesome. 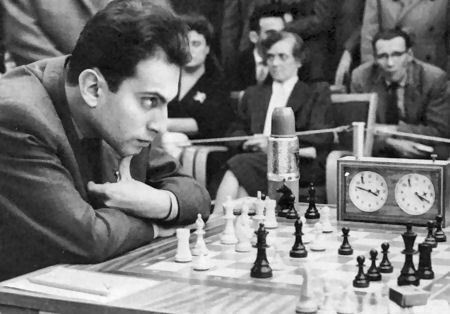 Where to watch "Mikhail Tal From a Far" documentary? I am currently reading "Mikhail Tal's Best Games 2 1960-1971 The World Champion" by Tibor Karolyi Very Good book!